Last night, the Cristian Rivera Foundation was featured during the Latin Mixx Conference (LMC) Awards Ceremony at The Times Square Center. The ceremony marked LMC’s 6th year in the making, and honored the top Latino DJ’s and promoters in the business. Founder, Kevin “Pills” Monatano, acknowledged the growing strength of the Latino population and pulled all the stops in coordinating this meeting of the minds for the three-day conference. The awards ceremony was hosted by Sito Rocks, K. Marie, BET & 105.1 FM’s DJ Prostyle, and BET 106 & Park’s very own Rocsi. However, hands down the most hysterical antics where Comedy Central Premium Blend, Galavision Que Loco, and BET Comic View’s Jason Andors who kept crowd in stitches with his dance moves and impressions. 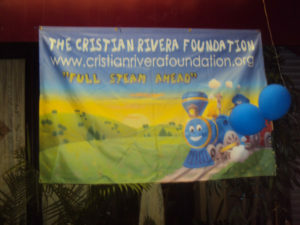 Later in the evening, the Cristian Rivera Foundation’s Founder John “Gungie” Rivera spoke on behalf of the Foundation in a heartfelt presentation about the devastating effects of diffuse intrinsic pontine glioma or DIPG. Rivera extended his praise to all nominees for having come so far, and conveyed his enthusiasm for being Latino in the entertainment industry right now. Rivera also went into the grim details surrounding the loss of his son to the inoperable brain stem tumor, DIPG. 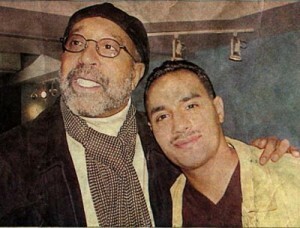 He asked for the parents in the audience to identify themselves and related, “One thing for sure is that we love our children more than anything, that’s the greatest love that we could ever experience.” He spoke about how he created the foundation shortly after his son passed with the support of committee members in the audience like DJ Camilo and Tedmooth. Rivera ended his presentation with a story of hope. In January, a 6 year old girl from Spain was operated on by Dr. Mark Souweidane of Weill Cornell Medical College and Memorial Sloan-Kettering Cancer Center in an effort to save her life. Dr. Souweidane’s viable scientific research has recently shown promise of a cure and that operation marked the launch of his medical trials. A girl who supposedly had just weeks to live, is stable 7 months later. Rivera extended his best wishes to the young girl and her family. 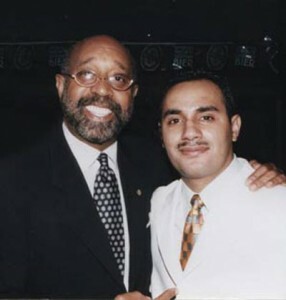 The Cristian Rivera Foundation and its members look forward to a continued relationship with Latin Mixx. Overall, it was inspiring to see so many successful Latinos united to recognize each other’s accomplishments. 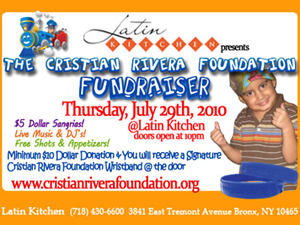 Bronx restaurant Latin Kitchen was the site of the Cristian Rivera Foundation’s most recent mini-fundraiser event on July 29. 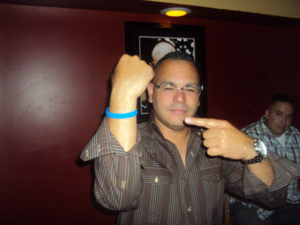 The restaurant, located at 3841 East Tremont Avenue, becomes a lounge every Thursday night and on this particular Thursday, everyone who came after 10pm paid a $10 donation and received one of the Cristian Rivera Foundation’s signature blue wristbands. Latin Kitchen’s DJ Lucho Concepcion and Robert Vasquez organized the event, which featured music from resident DJ Victor Vargas, as well as Cristian Rivera Foundation Committee Member DJ Tedsmooth. Committee Members Kenya Bradix, Solange Osorio and Steve Cox were all there to support the cause. Lots of John “Gungie” Rivera’s friends, as well as friends of the Cristian Rivera Foundation came out and everyone had a great time.